Australian grantmaking charities provide more than $4 billion annually in grants and donations, and hold more than $56 billion in assets, according to new research. Australia's Grant-making Charities in 2016, a sub-report of the Australian Charities Report 2016, was produced by the Australian Charities and Not-for-profits Commission (ACNC) in partnership with the Centre for Social Impact and the Social Policy Research Centre at the University of New South Wales. The report assessed the activities of 10,398 grant-making charities in the 2016 reporting period. It was released by ACNC Commissioner Gary Johns on March 14. Our Community executive director Kathy Richardson said the report provided a great supplement to the work undertaken by Our Community over many years to analyse and report on the funding trends of government, philanthropic, corporate and community grantmakers. "Through our analysis of grants data flowing through our Funding Centre and SmartyGrants platforms, as well as our annual Grants in Australia survey, we now know so much more about the movement of grant funds than we did a decade ago," Kathy said. "This report represents another giant leap forward. It's fantastic to see the data that charities are providing to the ACNC being set free so that we can all learn from it and hopefully use it to make grant dollars go a little further in future." Kathy said some of the data in the ACNC report was unexpected. "I was surprised to learn that there are more than 10,000 charities that carry out grantmaking activities in Australia - that's a fifth of all charities! "We know there's a lot of money being distributed in grants around Australia - we estimate at least $56 billion a year from all sources, the lion's share of that from government - but we didn't know there were that many charities in the mix. "Some other stats in the report indicate to me that many grantmaking charities are operating well below the radar. For example, 36% reported giving a majority of their grants for capacity building, rather than project-based funding. That will be surprising to many grantseekers whose major complaint is that too few grantmakers provide funds for core costs." The ACNC report revealed that only 35% of grantmaking charities use an open application process. "I'd love to know more about these organisations - it's in everyone's interests to know how grantmakers make decisions about who to fund," Kathy said. The ACNC report can be downloaded from australiancharities.acnc.gov.au, while information about Our Community's Grants in Australia survey can be found at https://www.ourcommunity.com.au/grants2018. 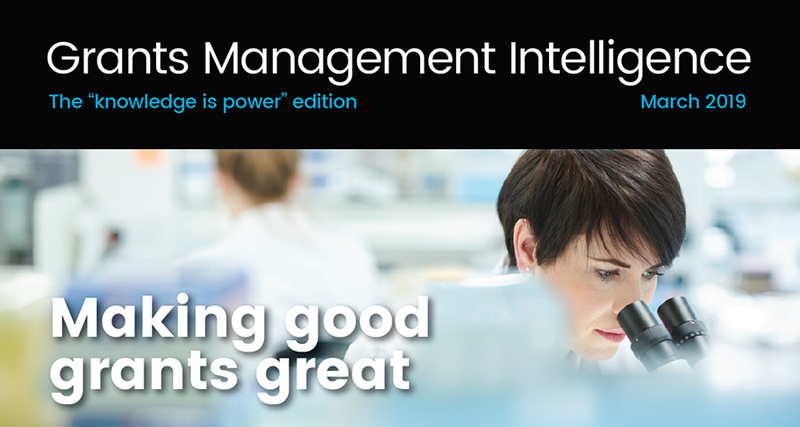 At the Australian Institute of Grants Management, we're always on the lookout for funding and grantmaking experiments that increase bang for buck. Here are our top trends for 2019. In this "knowledge is power" edition, we're delivering on our commitment to making grantmakers' jobs easier by sharing specialist knowledge from the field. Whatever happened to evidence-based policy making? An abridged version of Gary Banks' address for the Alf Rattigan Lecture for the Australia and New Zealand School of Government (ANZSOG) that points the way for what's worked in the past, and what can be done to avoid policy on the run. Leading Australian philanthropist Alan Schwartz is tackling one of the hardest challenges the planet faces: to put a true value on the social and natural capital of the world, including health, literacy, trust, clean water and biodiversity.